Situated in the picturesque Huon Valley, Home Hill Winery Restaurant is renowned for its locally sourced ingredients and breathtaking views over Mount Wellington. Surrounded by lush, sweeping hills, the restaurant’s floor to ceiling windows gives diners the perfect vantage spot to dine with a view. The modern Australian menu is elegantly presented and features produce from the surrounding paddocks, as well as daily caught fish for a truly memorable dining experience. Place Categories: Dine in Huon & Channel.Place Tags: breakfast, bruny, cafe, channel, coast, cygnet, dine, dining, dinner, eat, franklin, huon, huonville, kettering, lunch, margate, restaurant, snug and valley. 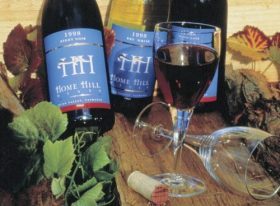 Home Hill is a winery, cellar door and restaurant at Ranelagh, in Tasmania's Huon Valley.